After the heart breaking defeat against Newcastle United at home Chelsea's Premier League campaign to secure the 4th and final Champions League spot is all but over. With two games to go and 4 points separating Tottenham and Newcastle from Chelsea only a miracle will see Chelsea finish 4th. Yet all is not lost for Chelsea. Despite having a rather up and down, rocky season which saw Andre Villas Boas being sacked and interim manager Roberto Di Matteo being a fantastic job in keeping Chelsea in the hunt for more silverware. With Chelsea having secured places in the Champions League final beating the likes of Barcelona, Benfica and Napoli and the FA Cup final. Yet now we come to the most crucial section of Chelsea's see-saw season. With 4 games remaining to go: Liverpool twice, Blackburn and Bayern Munich, Lets take a look at Roberto Di Matteo's game plan. Lets take a look at what he is planning so Chelsea can end the season on a high. Di Matteo: As a Chelsea Player! With John Terry and Branislav Ivanovic banned for the Champions League final and David Luiz and Gary Cahill suffering from injuries it is a serious problem for Chelsea as to who will play in the central defense. With David Luiz expected to make a return to the lineup against Liverpool in the Fa Cup tomorrow it is certain that he will partner Terry. Ivanovic will be restored to his right back spot. The Chelsea physios are on a fast track to have Gary Cahill ready for the match against Bayern Munich but if that does not happen a few other options can be used( read Michael Essien). During the time when Claude Makelele dominated the Chelsea midfield, Michael Essien often played at right back. Given the current crisis I don't think that there would be any trouble in having either Bosingwa or Essien play Central Defense with the other taking right back for the Bayern game. Sam Hutchinson the comeback-man of Chelsea could also be employed as a shock stopgap given his rating as the next John Terry of the Bridge. One of the biggest points of concern for Di Matteo is who to start with in the next few games. Should he back on the resurgent Fernando Torres or must he start with the powerhouse Didier Drogba? Chelsea goalkeeper Petr Cech has asked for unleashing both Torres and Drogba on opponents, which albeit mouth-watering is not a very smart move at this stage of the season where the Chelsea squad has adapted to Di Mateo's4-2-3-1. Torres or Drogba or Both? Although not an embarrassment of riches to choose from Chelsea definitely has enough stocks in this department. The question that remains is who starts. Should Mata be played as Left Winger or Central Attacking Play-maker? Should Lampard start as the Play-maker or should he start alongside a defensive midfielder? Can Lampard and Co. recreate their Magic? Which two players plays in the defensive midfield spot? For the FA Cup game it seems certain that Raul Meireles could partner either Michael Essien or John Obi Mikel for those two spots. Also of concern is who starts on the Right wing. Should pocket rocket Ramires be preferred to Chelsea's leading-yet-a-tad-bit-selfish top scorer Daniel Sturridge or could a new and improved Kalou be used? Given that Meireles and Ramires are banned from the Champions League final we could see Mikel/Essien partner Lampard in central midfield with Sturridge, Mata and Kalou starting as Left Wing, Attacking Midfield and Right Wing respectively. 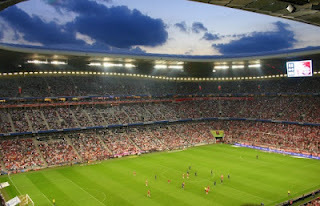 Allianz Arena: The Scene for the final battle! With Roberto Di Matteo making it clear that he will not step down to the Assistant Manager's post if a new Manager is appointed, it becomes obvious that he is trying to make a point to Roman Abramovich by guiding Chelsea to a pretty decent record of P17-W11-D4-L2. Which is great for an Interim Manager. Yet Di Matteo wants, and really deserves more. From picking up a broken team who had lost the first leg to Napoli 3-1 and were down and out, to guiding them to their second ever Champions league final is a wonderful achievement. Di Matteo: The Players Manager! For a manager who was sacked by lowly West Bromwich Albion, a manager whose job application to Championship team Birmingham City was rejected Di Matteo has surely come a long way. Beating the best team in the world (read Barcelona) and yet not being sure of a place in next year's Champions league is not something you would expect from a team in the same season. Yet here we are. Rumor has it that Di Matteo has the players support in being appointed manager which counts for a lot at Chelsea. If Di Matteo's boys can engineer a shock victory over favorites Bayern Munich who play at home at the Allianz Arena and also secure a FA Cup victory on the way, there is no doubt in my mind that Roberto will seal the job. Apart from being an unusual inexpensive appointment he will be managing his own former club. The desire to win and succeed for the club will be something which cannot be replicated by any high profile manager be it, Laurent Blanc, Didier Deschamps, Luciano Spaletti or even Midas like Josep Guardiola.